Meteorologists have them. Economists have them. And so do hydrogeologists. Complex computer models, backed by powerful processing power, help us understand and predict weather, wall street, and water. Indeed, groundwater models as predictive tools to forecast water movement and availability are a critical part of a hydrogeologist’s toolbelt. Recently, Aspect hydrogeologists Seann McClure and Aaron Pruitt attended and presented posters at groundwater modeling’s premiere conference: MODFLOW and More, hosted in Golden, Colorado. MODFLOW, the three-dimensional groundwater model developed by the USGS, is the industry standard for simulating and predicting groundwater conditions, and has been used to simulate everything from the impacts of climate change on groundwater/surface water interactions to the fate and transport of groundwater contamination to the intrusion of seawater into deep aquifers due to water supply developments. The conference is held every two years by the Colorado School of Mine’s Integrated Groundwater Modeling Center, and draws an international list of attendees from the consulting, academic, and government spheres to discuss all things MODFLOW and groundwater modeling. Seann and Aaron each presented a poster describing Aspect groundwater modeling work. Seann’s poster presented on Aspect’s years-long work at Lora Lake wetland restoration, located adjacent to SeaTac Airport. The presentation, Groundwater Modeling to Support Wetland Restoration of a Former Peat Mine, discusses groundwater modeling completed to evaluate alternative cleanup scenarios at a former peat mine-turned-suburban lake located next to the SeaTac Airport’s new Third Runway. The lake has historically received stormwater discharge impacted by dioxin/furans and is being restored to a scrub-shrub wetland to remediate contaminated lake sediments through capping and filling in the lake. The groundwater modeling, sediment cap, and wetland restoration is part of a larger environmental remediation and construction effort led by Floyd|Snider on behalf of the Port of Seattle that also includes excavation of impacted sediments in the neighboring parcel. Aaron’s poster presented Aspect’s work on assisting a large Puget Sound public agency with predicting water supply availability in an urban area. 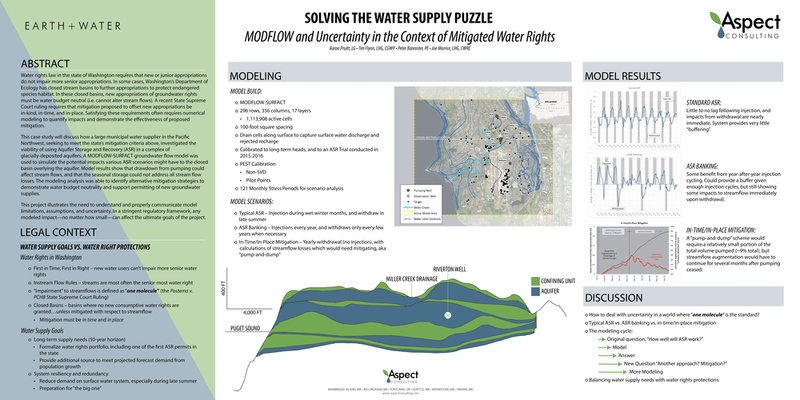 The poster, Solving the Water Supply Puzzle: MODFLOW and Uncertainty in the Context of Mitigated Water Rights, focuses on the complexity of quantitative analysis necessary to satisfy permitting standards under Washington’s water rights regulations. Recent State Supreme Court decisions constrain mitigation options to those that meet a high bar of being “in-kind, in-place, and in-time”. This means any change to water levels or flows in a closed basin, no matter how small, is considered an impairment, and therefore grounds for rejection of a new water right. This stringent benchmark is even more difficult to deal with when it comes to using numerical groundwater flow models. Groundwater modeling requires simplifying assumptions about the system, which adds a layer of quantitative uncertainty on top of this already rigorous standard. In support of Seattle Public Utility’s effort to permit a future groundwater supply source as a component of resiliency planning, Aspect used MODFLOW to explore various water rights permitting strategies to determine the most defensible approach to in-time, in-place, and in-kind mitigation that balances water rights protections with the agency’s need for new water supply options.